Here is another great teacher gift idea. 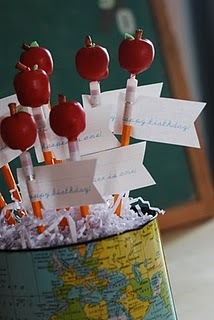 How about an apple cake pop served with new pencils. Not only will they receive the pencils they need for the classroom, but a sweet treat as well. While this tutorial on SweetCheekTastyTreats were originally made for her daughters birthday party, they are little sign can easily be changed to say whatever you would like it to say. You can see the tutorial for these here on SweetCheekTastyTreats.